After washing face, apply with hands or cotton pad, let dry then apply moisturizer. 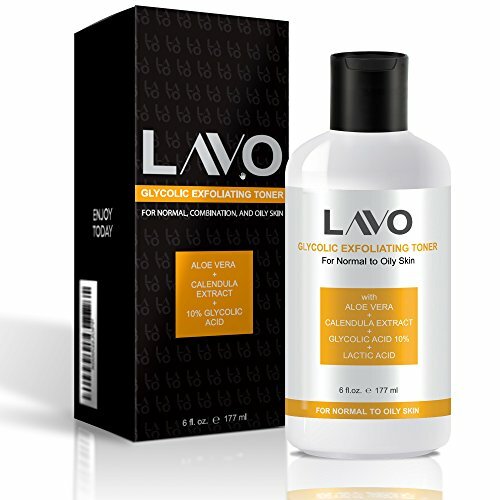 Click the 'Add to Cart' Button Above and get Your LAVO Glycolic Exfoliating Toner Now! 10% GLYCOLIC ACID (AHA) exfoliates dead skin cells, diminishes sun damage, and reduces fine lines ENSURING declogged pores and clear new skin. PREPARES FACE for Serums and Creams. Helps skin absorb final step moisturizers making them more effective in penetrating deeper into the epidermis. 100% SATISFACTION GUARANTEED - No Animal Testing, No Parabens. Made in USA + Smells great!. Try it out, if it's not for you we'll give you a FULL refund + you keep the toner.